For those who are followers of the A. Lange & Söhne Watchmaking Excellence Award the name of watchmaker Torsti Laine is not totally unknown. For others, he probably needs a small introduction. Harking originally from Finland, where he was a graduate of the renowned Finnish School of Watchmaking, he has worked with Kari Voutilainen and at A.Lange &a Söhne, where he won the aforementioned Lange Watchmaking Excellence Award in 2014. Now operating independently as a watchmaker in Le Locle, in 2016 he released the Classic Chronograph, which was followed this year by the Laine 1817. The Laine 1817 is a manual-wind watch with a reworked movement is inspired by (and a tribute to) 19th century pocket watches. The ‘1817’ of the name isn’t for any special event from that year, but simply a case of how watch engraving was popular two hundred years ago and well, it’s now 2017. A highly decorated movement is the key to this new model. Based on the ever reliable Unitas 6498, it features hand-engraved fleurisanne patterns, a floral technique named for Fleurier, from where it originated. Screw and jewel sinks are hand polished, and there is black polishing on the screw heads. The engraving work is attractive and nicely done. The 1817 comes in a limited series of ten in each colour of movement finish – 5N red gold, 3N yellow gold, and rhodium (black or blue). The cases are all 41mm of stainless steel with a thickness of 12.2mm. What can you customise? 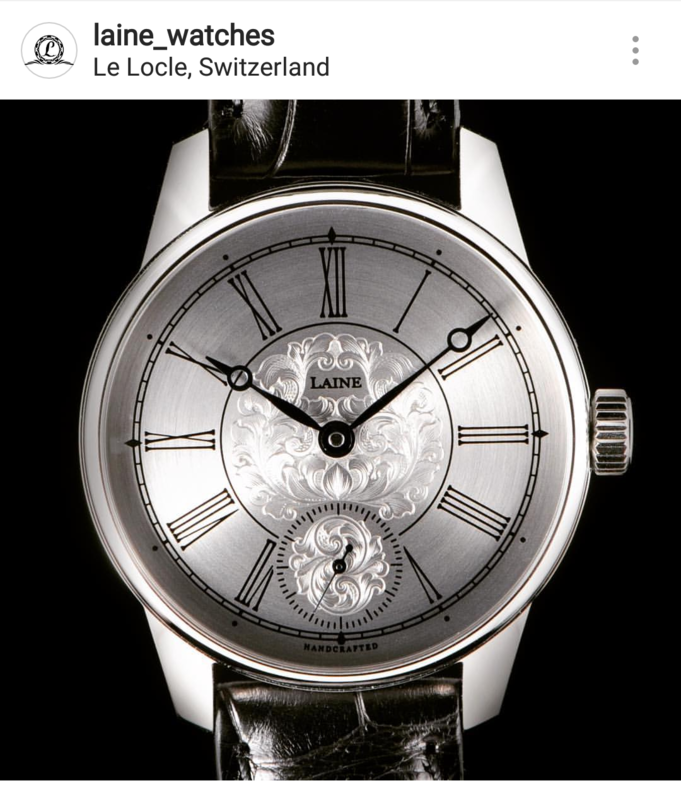 The dials you will see on Laine’s website and in the promotion materials are black, white or blue lacquer, and there several choices for hands, including Breguet and dauphine, but there is also an engraving option. The dial on the 1817 that is featured in this post has been customised, which involved a new pad print (which incurs a cost dependent on the complexity of the design). As mentioned, the basic dials are white and black lacquered ones, but there is also the choice of a sunray brushed dial. Those who follow Laine on Instagram will have seen some engraving options as well. You can have either half the dial engraved, which will cost you a further CHF 550, or a full engraving, which is three times that. I’m particularly taken with the half engraved example he posted on Instagram, which is a very attractive option. So how is it to wear? It’s comfortable on the wrist, and there are no aspects of the size, thickness or lugs that warrant particular mention as being unusual. If you’re accustomed to wearing watches within this sort of a specification, then it will feel familiar and fit you nicely. In the past few years we have seen a growth in small brands and what we might call ’emergent independents’, of which Torsti Laine is an example. The existence of online spaces on social media beyond the traditional watch fora has been a boon both to these brands in terms of awareness, and for those enthusiasts and collectors who are keen to support new brands. 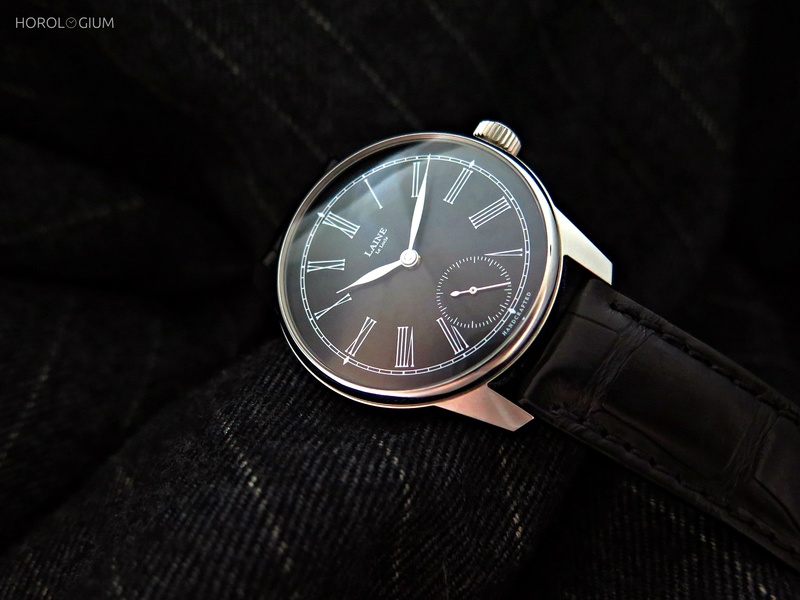 I had this watch for a couple of days, and at the end of it I was left thinking that if you are looking for something from an independent brand at this price point that can be customised, the Laine 1817 is definitely something worth considering. It is an easy watch to like, and the very handsome engraved movement is what gives it that extra touch. The starting price is CHF 4170 plus taxes. Contact Torsti Laine via his website with enquiries or to place an order.